FORMER President Robert Mugabe reportedly flew back home yesterday after spending Christmas and New Year holidays in the Far East, where he had gone for medical check-ups. Presidential spokesperson, George Charamba could neither confirm nor deny Mugabe’s return, but sources said Mugabe landed at Robert Gabriel Mugabe International Airport in the afternoon in the company of his nephew, Patrick Zhuwao, who was in self-imposed exile. “I don’t know if he is back, but he was expected back home today (yesterday). Whether he has returned or not, I would not know, since I am here at work. But as I said, he was expected to be back on January 4,” Charamba said. Sources at the airport said Mugabe was accompanied by Zhuwao, who went into self-imposed exile following his uncle’s ouster in November last year. NewsDay could not independently confirm reports that Zhuwao was back in the country as the former Public Service minister could not be reached for comment on his mobile phone. Mugabe flew out of the country just before Zanu PF’s extra-ordinary congress, which elevated former Vice-President Emmerson Mnangagwa to succeed him both at party and government. The former President travelled with a sizeable entourage of security personnel after being pushed out of office by Zanu PF with the aid of the military under a manoeuvre codenamed “Operation Restore Legacy”. Before his ouster, Mugabe often spent his December annual leave holidaying in the Far East, where he also took the opportunity to have medical check-ups. 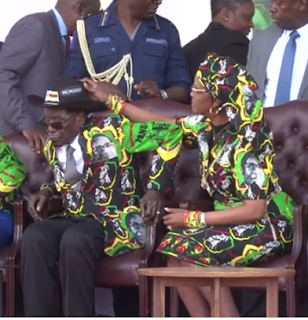 His health and age had become a major political issue that it topped the list of the reasons outlined by legislators from Zanu PF and opposition parties for his impeachment in Parliament.